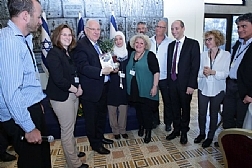 IACC Community Centers' directors, top leadership and representatives of Oranim Academic College were invited by the Honorary President of State Mr. Reuven Rivlin to an open discussion in order to unveil and launch the IACC' s vision of coexistence, mutual respect and tolerance in our society. …. " What seems like a dead end, an inflexible conflict, may become an opportunity through your remarkable actions. You are holding the vital keys to lead the so much desired change in our society. I congratulate you on your remarkable activity which gives me strength and hope!" …..were the President's words. 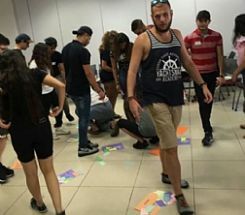 Aviad Friedman, Chairman of the IACC particularized, "We must choose the unifying elements as opposed to those that separate and divide us; the gentle, modest and profound as opposed to violence and superficiality. We know how hard it is to go against the trends, how difficult it is to make a difference. But we at the IACC have proved that we can, that we are not afraid to go against the trend and we shall continue to lead the desired change. " Women, men, religious and secular, from all over the world, are remembering the holocaust. 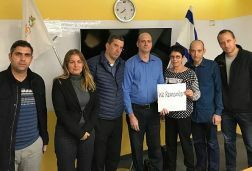 The IACC- Israeli Association of Community Center's staff and the Board of Directors- joined the new social-network campaign initiated by the World Jewish Congress this week, posting personal photos with a "We Remember" sign, as part of the International Holocaust Memorial Day. 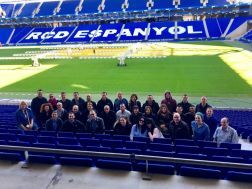 Sports coordinators from IACC's Community Centers from all across Israel traveled this week to Barcelona- the capital of world soccer. The delegation's purpose was to deepen the knowledge regarding the significance of sport and sportive-values in the framework of communal work, as part of IACC's "community building" mission.